Each summer, in addition to classroom learning and FFA activities, students engage in a Supervised Agricultural Activity (SAE). This helps students better understand the agricultural field by giving them a hands-on experience. Members are able to complete an assortment of SAE projects including ownership/entrepreneurship of any agricultural business, job placement in an agricultural based business, research through experimentation, and exploration of a career in agriculture. Members are visited by an FFA advisor to monitor their SAE. This experience not only gives members agricultural exposure, but also teaches responsibility and helps to keep students on track for specific fields. Each year a student participates they grow by contributing to their chapter and own knowledge, but also helping the student push for broader horizons such as a State FFA degree. Pictured are Hillsboro FFA members Claire Wilkin, left, and Ashlie Hillyer with goat production SAEs. https://www.timesgazette.com/wp-content/uploads/sites/33/2018/09/web1_SAE-projects-pic.jpgEach summer, in addition to classroom learning and FFA activities, students engage in a Supervised Agricultural Activity (SAE). This helps students better understand the agricultural field by giving them a hands-on experience. Members are able to complete an assortment of SAE projects including ownership/entrepreneurship of any agricultural business, job placement in an agricultural based business, research through experimentation, and exploration of a career in agriculture. Members are visited by an FFA advisor to monitor their SAE. This experience not only gives members agricultural exposure, but also teaches responsibility and helps to keep students on track for specific fields. Each year a student participates they grow by contributing to their chapter and own knowledge, but also helping the student push for broader horizons such as a State FFA degree. 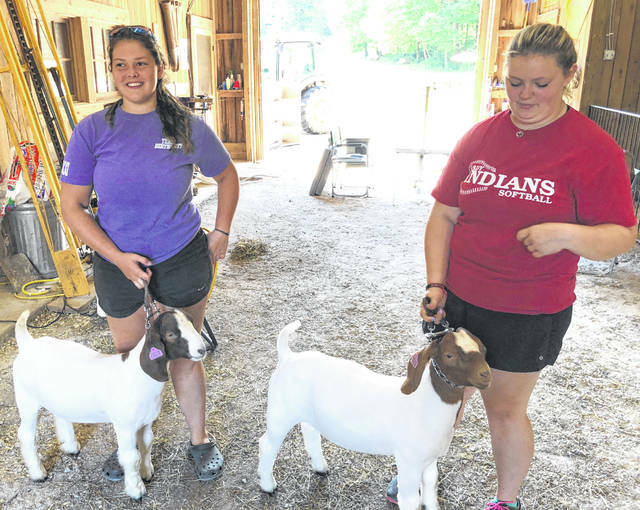 Pictured are Hillsboro FFA members Claire Wilkin, left, and Ashlie Hillyer with goat production SAEs.